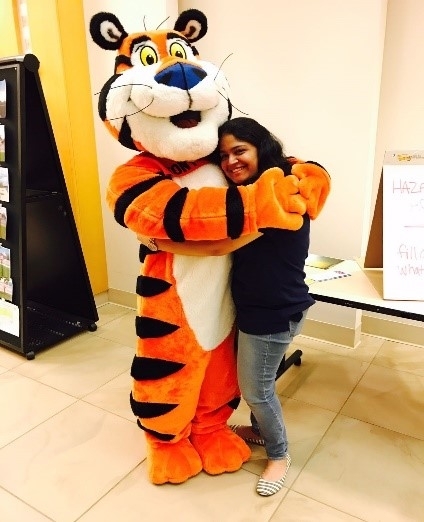 Shilpa Samant, a Bumpers College doctoral student in food science, gets a hug from "Tony" the Tiger, the mascot for Kellogg's Frosted Flakes. Samant was named Kellogg's 2017 Outstanding Intern. FAYETTEVILLE, Ark. – Shilpa Samant, a University of Arkansas food science doctoral student, has been named the 2017 outstanding intern by the W.K. Kellogg Co.
Samant, a student in the Dale Bumpers College of Agricultural, Food and Life Sciences, completed a six-month internship at W.K. Kellogg Institute for Food and Nutrition Research at company headquarters in Battle Creek, Michigan, during the summer and fall. Samant, who is from Mumbai, India, has been awarded Kellogg's 2017 Liz Gillis Intern Memorial Scholarship. Samant was selected over other interns from Purdue University, Kansas State University and Michigan State University. Her primary project was to develop a technique to measure emotional responses to Kellogg products using different types of descriptors. She also had a variety of experiences working with personnel at various levels of the company, including serving as business unit support for different projects which involved working with product development, marketing and insights teams. While learning the industrial application of sensory science, Samant also gained hands-on experience in leading qualitative consumer focus groups and interacted with other interns as a member of a product development team that created a novel food product. She also further developed her professional network through attending various training workshops. Samant, who works in food science associate professor Han-Seok Seo's sensory science laboratory, earned her bachelor's degree in food engineering and technology from the Institute of Chemical Technology in Mumbai. She earned her master's degree in food science from the U of A in 2015. Her doctoral focus is on sensory science. Her dissertation topic focuses on developing a methodology for predicting consumer preference and behavior toward beverages. Samant has earned several awards and scholarships. She received the Institute for Perception Student Award in 2016 and won the 2015 Rose Marie Pangborn Graduate Student Oral Competition Award from the Institute of Food Technologists. She also earned the Feeding Tomorrow Graduate Scholarship from institute in 2016 and was Bumpers College's Distinguished Ph.D. Scholar in 2017. In 2015, the Research, Quality, Nutrition and Technology Department at Kellogg established a memorial scholarship in the name of Elizabeth Gillis, a former colleague who passed away. Gillis was a 22-year veteran whose positive influence, technical depth, creative problem-solving and teamwork were well known within the organization. The department honors her by awarding this scholarship to an intern who best exemplified her persona of personal character and technical acumen.